KitchenAid is launching a mobile food truck tour this spring to connect with local golf fans and cooking enthusiasts in advance of the 2018 KitchenAid Senior PGA Championship in Benton Harbor, Michigan. 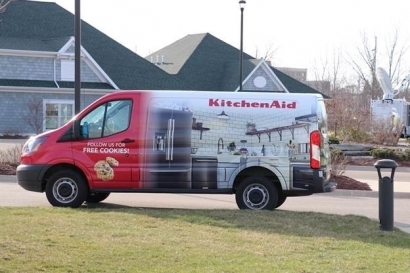 The brand has developed a fully customized truck, donned with KitchenAid and Championship branding and stocked with free home baked cookies. The KitchenAid Food Truck is hitting the road to promote the brand’s title sponsorship of this historic major Championship while previewing the on-site experience that fans will find at Harbor Shores. During a four-week span, the KitchenAid Food Truck is making 14 appearances in 12 cities across Michigan and Indiana before it arrives in Benton Harbor, for the 2018 KitchenAid Senior PGA Championship over Memorial Day Weekend. Ambassadors from KitchenAid and the PGA of America will be on hand at each stop to deliver free cookies and a select number of tickets to the Championship, and fans can also enter for a chance to win a Stand Mixer, the iconic countertop appliance from KitchenAid. Fans can follow the food truck and learn more about the KitchenAid Senior PGA Championship on Twitter at Twitter.com/KitchenAid_Golf. Tickets can be purchased online at SRPGA.com.